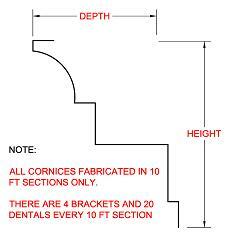 A cornice is a decorative piece of molding that extends beyond a roof. It is horizontally situated and may be interior or exterior. 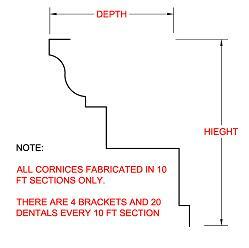 Cornices are most commonly fabricated in materials that can be soldered such as copper, lead coated copper, stainless steel, terne coated stainless steel, zinc & galvaninized metal. However, thay can also be made in weldable materials like aluminum kynar and polyester. B&B combines tradition with cutting edge expertise and state-of-the-art technology to conceive, design, and fabricate custom cornices to your projects specifications. B&B Sheet Metal is recognized by the New York State Landmark Conservatory and has been fabricating cornices since 1901. We can manufacture any style cornice — from the simplest style to the most elaborate. Typically, we bend copper or lead-coated copper materials into curved patterns and then connect attachments. Whether it is replication of an existing styled cornice or fabrication of an original design, our in house shop technicians are well-trained and have years of experience in customizing to your exact specifications. We can replicate any non-stamped cornice piece. However, if you would rather supply us with a pre-existing stamped part we can attach that as well. We do not recommend using less expensive materials such as galvanized and stainless steel because they do not ultimately save you money. These materials are more difficult to work with and require extra labor. The only exception would be if there are no attachments and minimal mitering. We also do not recommend using more expensive materials such as terne coated stainless steel, freedom grey (zinc coated copper) or evergreen because the quality is still the same. The Amsterdam Cornice is an ornate molding that completes and crowns the top of a building or wall. Our high-grade metal material cornices are engineered with the utmost attention to detail. The Amsterdam Cornice is inspired by the Gothic revitalization in the architecture world. Our engineers have handcrafted this design by mixing and matching traditional models and coming up with an end-result that will beautify and accentuate your roofline. As always, we can tailor-fit this design and make any modifications to help make it speak entirely to you and your particular taste. The Cortez Cornice exudes and old world charm and elegance to it. Whether to add to the continuity of the existing design motif, or to make a statement of its own, our metal cornices are the tastemakers of the industry. 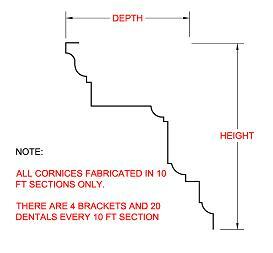 The Cortez Cornice is more than a projection or molding for a window or wall, rather it is an artistic and poetic way to add flavor and style to your home or building. Available in many different metal material options, the Cortez brings traditional grandeur and architecture into the present day with the fortitude and contemporary bliss of high grade metals. 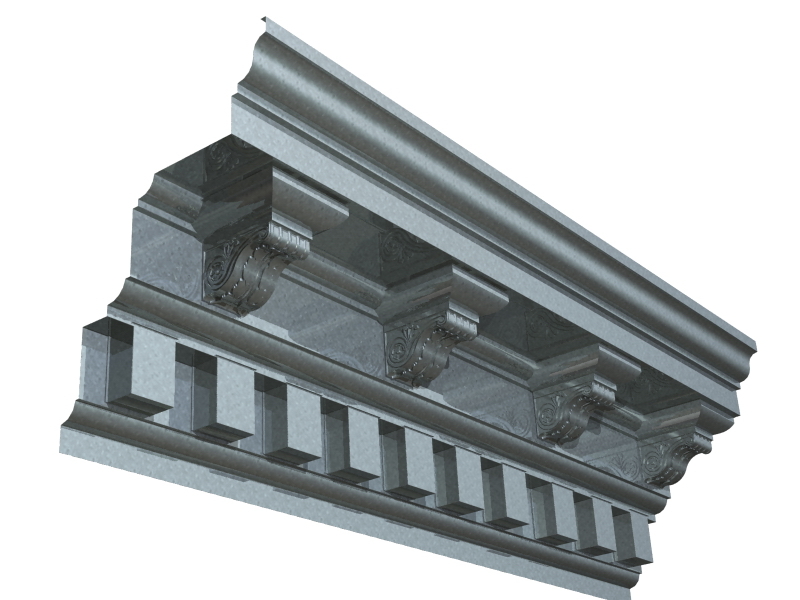 The Crest Cornice serves as a defining element in your decorating scheme. It helps to illuminate and frame the tone and style of the room for a very reasonable price. The Crest Cornice helps to dramatize the look and feel of the room with a modest yet meaningful tone and design mentality. It has a very subtle charm about it, that helps it appoint itself modestly yet artistically to consist and complement any existing design modality. It comes available in a number of material options so you can choose what works best for you. The Gotham Cornice is contemporary and chic just like the origin of its name. With a fine-tuned yet modish design element, this piece exhibits an effective and cost-effective way to utilize space and to dramatize the decor. The Gotham Cornice is a slice of NY life. With its robust yet universal design, this style is emblematic of the NY lifestyle. You can pick and choose the exact specifications and the desired metal material option using our intuitive and helpful online merchandising system. If you would like to customize or specify something not on the menu just call one of our friendly and knowledgeable customer service reps. The Lafayette Cornice helps to adorn and define the window or wall area. The cornice crowns and effectively utilizes otherwise dead space to dramatize and create from nothing. The Lafayette Cornice represents modernist architecture with a rich historical foundation. 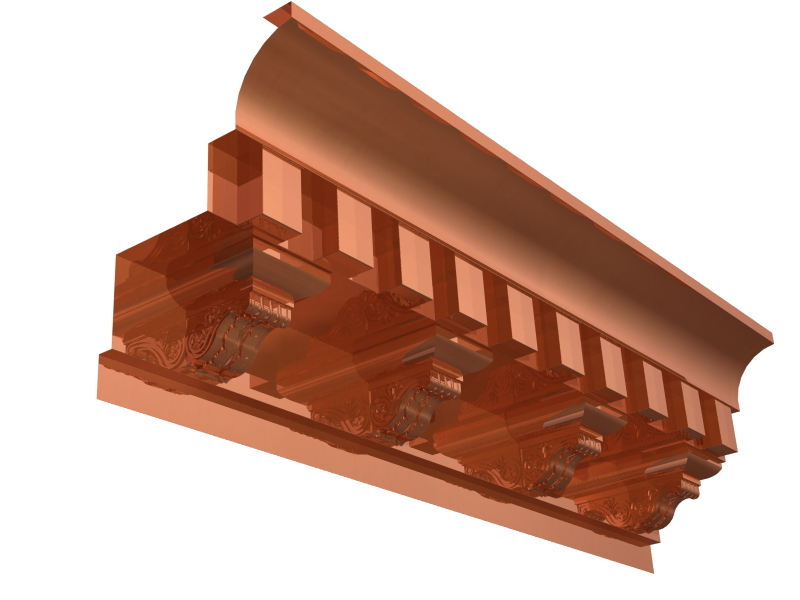 Once responsible for acting as gutters and eaves, the cornice nowadays serves a purely decorative function. However, the design element and value of a cornice is underscored and emphasized by the prevalence in nearly all skyscrapers or high rise building projects and many times in residential projects as well. The Verazzano Cornice represents the creme-de-la-creme in design styles. With its extreme attention to detail and its incredible craftiness, this piece is certain to create and modulate any existing design style. The Verazzano Cornice adds drama to any room with a window cornice. Plus, this cornice helps to hide unsightly hardware and brings texture and depth to the room, impacting and creating design motifs from nothing. This seemingly effortless and traditional design element can be yours for a rather reasonable price as well. All you have to do is pick which metal material and we will do the rest. The Williamsburg Cornice is a jet-setting design that exemplifies the bedrock of B&B’s quality initiatives and commitment. Combined with its ornamental stampings this cornice an architectural art form. The planning and creation of a custom cornice system is carefully executed and requires the skills of both artisans and craftsmen from inception to completion. The Williamsburg Cornice is a piece that exudes class and underneath its beautiful exterior is a product that is made and designed to last for years to come. Our design-in-mind and quality control measures help you in deciding at the point of purchase by providing you with the obvious choice among the competition. B&B has become a household name in the industry and we keep improving and refining our processes and products to bring you the best in class at manageable prices.